Bulldogs will have to figure out Schildroth, Mattson and two-time champ George Stevens. FARMINGDALE — There’s one task to go for the Hall-Dale boys basketball team. And it’s the toughest task yet. The Bulldogs are one win away from their first state title in 13 years, and George Stevens Academy stands in the way. That would be the two-time defending state champions. With wins in 63 of their last 65 games. And two Mr. Maine basketball semifinalists on the roster. • Key players: George Stevens — Taylor Schildroth (Sr., G), Max Mattson (Sr., C), Stefan Simmons (Sr., G/F). Hall-Dale — Ashtyn Abbott (Jr., F), Alec Byron (Jr., G), Tyler Nadeau (Sr., G), Jett Boyer (Sr., G/F). • Outlook: The best teams in both regions all season square off. George Stevens can play a variety of styles, with Schildroth capable of knocking down shot after shot from the perimeter and turning the game into a shootout, and the 6-foot-6 Mattson’s post presence making the Eagles more than able to win a slower, half-court game. Look for the Bulldogs to counter this by taking the opportunities they can to get steals and rebounds and run with them, with the goal of piling up transition baskets against an unsettled George Stevens defense. Hall-Dale’s defense led the way against Winthrop in the C South final, and it will need to do so again for the Bulldogs to end the Eagles’ reign. It’s daunting. And it’s just what the Bulldogs have been preparing for. From the opening days of the season until now, Hall-Dale has taken every opportunity to get itself in front of the best competition it could find. 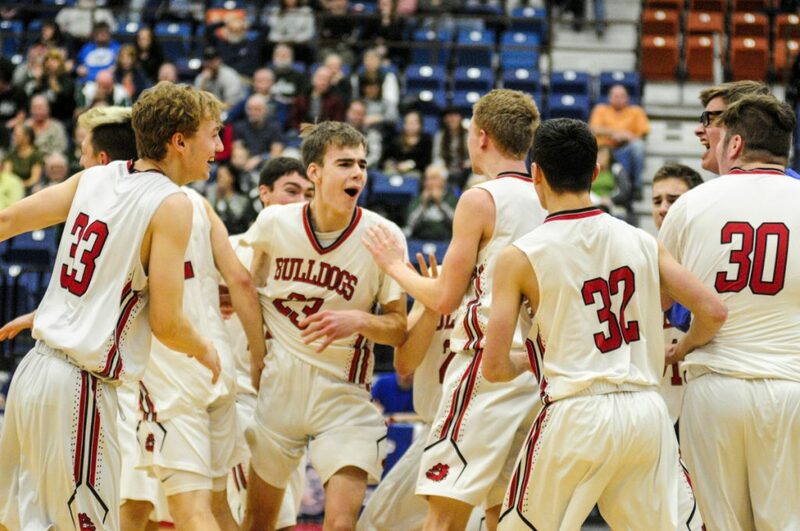 The Bulldogs played exhibitions against AA teams in Portland and Sanford, faced A tournament teams in Cony and Camden Hills and even got an out-of-state matchup with Amesbury, Massachusetts in the holiday tournament. From the start of the season, it looked like Hall-Dale would be playing in some big games. Ranslow wanted to make sure they were ready. Another opponent in that mix was the one Hall-Dale will face Saturday. George Stevens came down to Hall-Dale for a Dec. 1 scrimmage, and there’s a degree of familiarity between the teams that can be rare for North/South matchups. There’s certainly talent on both sides. For the Eagles, that’s led by senior guard Taylor Schildroth, an explosive scorer, proven big-game player and Mr. Maine Basketball finalist, and senior center Max Mattson, a 6-foot-6 tower inside who blocks shots, grabs rebounds and was the team’s other semifinalist. While the Bulldogs have the defense on the perimeter to try to slow down Schildroth, they have no one over 6-3 on the roster, so handling Mattson could be a tougher challenge. There’s a blueprint Hall-Dale can point to, however; the Bulldogs went 3-0 against Winthrop and 6-8 Cam Wood this season, and were nearly even with Winthrop on the boards in their 51-37 C South final victory despite Wood pulling down 14 rebounds. The Bulldogs could take advantage of the Ramblers’ youth and inexperience, however. That won’t be the case against George Stevens, which has a hardened senior core that has aced every playoff test it could face. Ranslow said the goal won’t be so much to shut down the George Stevens weapons, as much as make them get their points in different, and perhaps uncomfortable, ways. It will be one of the few times this year that Hall-Dale has been the relatively up-and-coming underdog, but the Bulldogs have a skilled cast of their own. Forward Ashtyn Abbott is a dynamic talent and has emerged as one of the best all-around players in the Mountain Valley Conference, and guard Alec Byron has shaken off an up-and-down season to put together an excellent postseason, one that has seen him reach 20 points in all three games. The Bulldogs are also deep, with guards Tyler Nadeau and Josh Nadeau, swingman Jett Boyer and center Owen Dupont all playing key roles down the stretch. When it comes to using that cast to combat the George Stevens powerhouse, Ranslow said his team might tweak what it does, but it won’t be altering too much. After all, the Eagles may have the titles, but the Bulldogs are in this game for a reason.